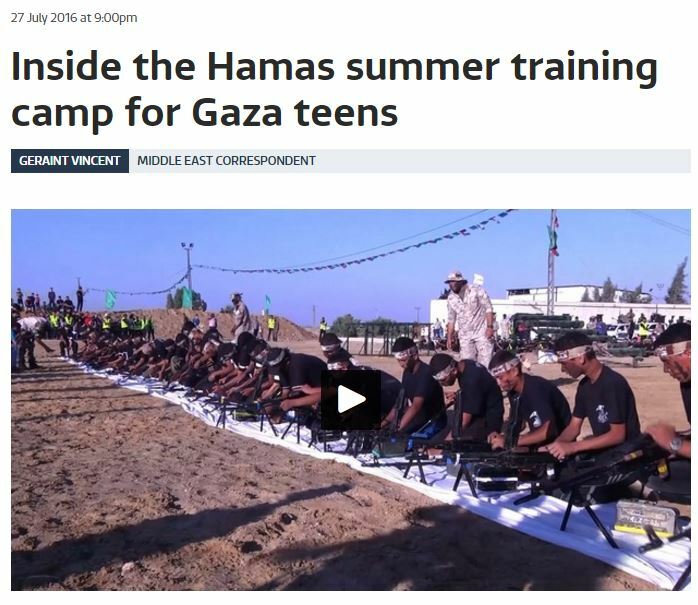 ITV News posted a report on their website (“Inside the Hamas summer training camp for Gaza teens”, July 27th) by Geraint Vincent on the notorious teen military camps throughout Gaza. ITV News predictably downplays the role of Hamas in reporting on deprivation in the territory two years after the war and casts Palestinians as victims of Israeli oppression. When visitors arrive, there’s none of the usual kerfufﬂe of a Palestinian welcome, with gilt-edged cups of beltingly strong coffee and bowls full of fat dates. There’s no running water for a start, and the electricity only comes for a few hours a day. Besides, there’s nowhere for us to sit.So Hamzi al-Masri stands in front of me, his shoulders slumped in the punishing summer heat, trying to convince me of the wealth of the life he once had. His wife Yasmin is embarrassed by their circumstances, busily shooing away her children to distract attention from the hospitality she can’t offer. Following these purely evocative and tendentious passages, they then precede to the putatively ’empirical’. Hundreds of millions of pounds of aid money was promised to people like the al-Masris after the destruction wrought by weeks of Israeli bombing. But the construction materials it has paid for still haven’t arrived. There are lots of political and bureaucratic reasons for that, but the biggest one is Israel’s continuing economic blockade of Gaza, which the UN has condemned as ‘communal punishment’. However, the claim that Israel’s blockade is the main cause of slow reconstruction is categorically untrue. As we’ve noted on these pages previously, the only items for Gaza which Israel restricts are those with a military dimension, or a potential military dimension (dual use items). The blockade does not limit cement or other vital building materials. Since the end of the war, and the implementation of (and Israeli cooperation with) the UN Gaza Reconstruction Mechanism (GRM), more than a million tons of building materials – 1,430,012.595 tons to be precise – have arrived in Gaza for projects coordinated by international groups, foreign countries, the PA and private parties. Second, a large percentage of the cement meant for civilian homes is illegally diverted by Hamas to be used for attack tunnels and other military infrastructure projects. Hamas reportedly often raids civilian construction sites to seize cement. Moreover, the specific inaccuracy in their report concerning the cause of slow reconstruction serves to advance a broader misleading narrative – suggesting that the militarism of Gaza’s youth is a natural byproduct of the ‘humiliation’ Palestinians feel under Israeli restrictions. Young Palestinians, the argument goes, enthusiastically train to kill Jews not because of Hamas’s extremist indoctrination or endemic societal antisemitism, but because of cruel Israeli policies which incite otherwise peaceful people to pursue jihad. There are many elements within the UK media’s institutionally inaccurate reporting on Israel and the Palestinian territories, but perhaps the most egregiously misleading meta-message absorbed by British news consumers relates to this stubborn insistence on infantilizing Palestinians by denying them moral agency. Until reporters and editors cease to view Palestinians as victims merely, and begin to take them seriously as agents of their own fate, no serious understanding of the complex problems plaguing their society and the overall region is even possible. And I am being kind. Moronic Socialists who deny reality staring them in the face – because to not do so would be Counter Revolutionary. Doesn’t the family’s last name, al-Masri, translate as ‘the Egyptian’? I’m not sure I see the objection to a journalist’s decision to set a scene using “purely evocative” language? That’s entirely usual in journalism and is also practised by journalists on the Israeli right. Because you really feel the family is embarrassed that they can’t offer big, fat figs to the kind though miserably naive Western Reporter who has been granted access thanks to a Hamas member connection? And you think you’re a real reporter? Why? I’m not sure you can see anything beyond the level of a two-year old. You call yourself a ‘journalist’? Good grief. You see, that’s just rude. It’s not a rebuttal. It’s not an argument. It is, in fact, *exactly* the sort of contribution one might expect from an under-informed two-year old. Which is ironic. How rude to be disrespectful of Hamass, Hezbullah, National Socialism, ISIS, Al Qada, Taliban, Boko Haram, Muslim Brotherhood, Fascist Iran, Labour Party. Tsk. Tsk. No, you sad slug – it’s a summary of empirical evidence gathered over many months, in which your stupidity, ignorance, infantile attitude, narrow horizons and bias have been demonstrated comprehensively. But you can’t provide any counter-argument to my point in this case other than the words “you sad slug” which don’t relate to the topic under discussion? Thought not. I could – but it’s been done above already. Can you even read? I watched it when it went out and it lacked any sort of context or pretence of a balanced report. The casual observer would have had the impression that Israel was the sole reason why Palestinians have no jobs and that the blockade is inhumane .You cannot tackle an issue like this in just a few minutes and do justice to a complex situation that is not Black and White .All it does is present Israel as the bully boy and the Palestinians as the innocent victims .The reality is not so simple.